Creating such a list is not easy. Debates are opened here and there. Everyone has their own opinion about who should be in or out. However, let’s just come to terms with the roster and enjoy this list together. This is nothing official, just my point of view. 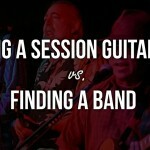 So let’s find out who my picks are, what they have imparted in the music industry, how they have achieved their success and popularity, and most significantly, how they have become influential to the world of guitar music. Born on June 6th, 1960. He is a world renowned American rock guitar player, composer, and a producer who has sold over 15 million albums. Steve Vai is known for having a perfect pitch, accurate ear, as well as having a deep knowledge of music theory. Notice that his playing style tends to be characterized as peculiar and “slanted”. This is why he is considered as having an exceptionally unique musical illustration. He has won 3 Grammy awards and 9 Grammy nominations for the past years of his career. He was also featured on the front cover of Guitar Player magazine and was voted as the Best Rock Guitarist. Some of the famous pieces of Steve Vai are: For the Love of God and Lotus Feet. November 27, 1942 – September 18, 1970. He was named as Johnny Allen Hendrix which was later changed by his father into James Marshall. He was a famous American guitarist and songwriter that later became a rock superstar during the 60s. He was considered as one of the greatest electric guitarists in music history. His style of music was often created with distortion effects using high electronic gain and treble. He often liked to use the “wah-wah” pedal in conventional rock. Jimi Hendrix, after his death he was entered into the US Rock and Roll Hall of Fame in 1992. He was also the first of Rolling Stone greatest guitarists of all times in 2001. Some of his famous pieces were his first singles: Hey Joe that hit the UK charts, The Wind Cries Mary, and Purple Haze. Born on July 15th, 1956. His real name is Joseph “Joe” Satriani. He is an American-Italian instrumental rock guitarist who also plays various other instruments, such as harmonica, banjo, harp and keyboards. 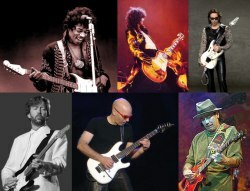 Of course, Joe Satriani specializes in guitar. He is known as one of the best guitarists in the world. Not without a reason. Because of his great talent, he has been nominated for Grammys 14 times, making him the second most Grammy nominated artist. He has sold 10 million albums across the world. Some of his popular pieces are: Summer Song, Flying in a Blue Dream, and Surfing with the Alien. Born on July 20th, 1947. He’s an Mexican-American rock guitarist who has become famous in the late 60s and early 70s. He and his band played rock, salsa and jazz fusion which featured his signature sounds of melodic blues-based guitar solos. Not only this but also some Latin and African rhythms accompanied with percussion instruments (such as congas and timbales) to add flavor to the music. Something not typically heard in rock music. He has once been inducted in the Rock And Roll Hall Of Fame and achieved 10 Grammy Awards and 3 Latin Grammy Awards. He was also the 15th Greatest Guitarist of All Time by Rolling Stone. Some of the popular songs he originally played are: Samba Pa Ti, Smooth (sung by Rob Thomas), and Maria Maria. Born on January 9th, 1944. His real name is James Patrick Page. An English songwriter, record producer and multi-instrumentalist. Page has been influential and versatile in rock history. Jimmy Page is viewed by critics and fans alike as one of the most influential and important guitarists and songwriters in rock music. He has been a part of the Rock and Roll Hall of fame twice. 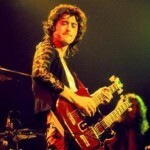 Some of the rock radio classic standards that he and his band played are: Dazed and Confused, Immigrant Song, Black Dog, and the famous Stairway to Heaven. Born on March 30th, 1945. His real name is Eric Patrick Clapton. He is an English guitar player, singer and song writer. He has been influential and important to guitar players because of his creative, blues-originated psychedelic pop. Amazingly, he has been a part of the Rock and Roll Hall of Fame three times. He has also ranked fourth in Gibson’s Top 50 Guitarists of All Time as well as fourth in Rolling Stone’s 100 Greatest Guitarists of All Time. Some of his famous songs are: Wonderful Tonight, Sunshine of Your Love, Tears in Heaven, and Layla. His songwriting skills later became very influential to the new generation of composers and singers. He was able to record 29 songs in the year 1936 and 1937 for the American Record Corporation. He was recognized by the Rock and Roll Hall of Fame as an “Early Influence” to music in 1986 and was top 5 in Rolling Stone 100 Greatest Guitarists of All Time. Some songs of his that became really popular are: Cross Road Blues, Love in Vain, and Hellhound on My Trail. Born on September 16th, 1925. His real name is Riley B. King. He is an American blues singer, guitarist and song writer. Now, he is considered as the “King of Blues”. You will most likely find him adorable because of his famous expressive singing and adaptable, intricate guitar playing style. He has also been part of the Rock and Roll Hall of Fame. He was listed as the third of 100 Greatest Guitarists of all Time by the Rolling Stone magazine. Popular songs of his are: Blues Boy Tune, the Thrill is Gone, How Blue Can You Get. Born on October 18th, 1926. Charles Edward Anderson is an African-American guitarist, singer and songwriter. He was one of the pioneering guitar players in rock and roll history which then lead him to be called as the “Father of Rock and Roll.” He is a very good entertainer with a superb showmanship making him an unforgettable performer to his fans. He has made his influences through refining and developing rhythm and blues into major elements, and making rock and roll music more distinctive. And for that, he was ranked sixth in the Rolling Stone’s 100 Greatest Guitarists of All Time in 2003. A couple of his songs also ranked in the Rolling Stone’s 500 Greatest Songs of All Time, such as: Johnny B. Goode, Maybellene and Roll Over Beethoven. Born on December 18th, 1943. He is an English guitarist, musician and songwriter, most famous for starting The Rolling Stones. His guitar playing style is characterized by playing sharp, real and direct tones, showing passion with chords and rhythm while avoiding some flashy skills when it comes to riffs. He was Rolling Stone’s top 10 of the 100 Greatest Guitarists of All Time in 2003. He was given the “Living Legend Award” by ABC, the Billboard Charts award for “Artistic Excellence” and many more. He is also a member of the Rock and Roll Hall of Fame. Some of his popular songs are: Take it so Hard, You Don’t Love Me, Wicked as it Seems. Born on August 21st, 1939. He is an American guitarist, known as the “Master of Telecaster” because of his distinct mastery in the said instrument. He has a unique country-rock style that combines flat-picking and finger-picking. In his career he has performed with artists like Elvis Presley and John Denver. He became a member of the Rock and Roll Hall of Fame in 2001. He has also been recognized by the Rockabilly Hall of Fame. Some of his songs are: Cluster Hello Mary Lou by Ricky Nelson and Suzy Q by Dale Hawkins. Born on April 3rd, 1949. Richard John Thompson is a British guitarist, songwriter, and recording artist. He has been considered the greatest guitarist in folk rock music. 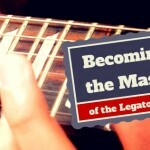 He is famous for his hybrid finger-picking style technique where he plays bass notes and rhythm with a pick between his finger and thumb, and at the same time he uses the rest of his fingers to create melody and punctuation by plucking the strings. He garnered some awards for his guitar playing such as Orville H. Gibson award for best acoustic player in 1991. Due to his song writing skills he also captured the Ivor Novello Award and in 2006 a lifetime achievement award from the BBC Radio. Some songs of his are: Beeswing, Heart Needs a Home with Linda Thompson, I Misunderstood. October 3, 1954 – August 27, 1990. Formally named as Stephen Ray Vaughan. He was an American blues guitarists who became very influential to Texas blues – a loud, swing-driven fusion of blues and rock music. However, his versatility allowed him to play jazz and ballads too. He won 6 Grammy Awards and was nominated 12 times. His debut album “Texas Flood” which was released in 1983 earned a double-platinum record. After his death he became a part of the Blues Hall of Fame in the year 2000. Some songs popularized by him are: Crossfire, Change it, and Life Without You. January 23, 1910 – May 16, 1953. His real name was Jean Reinhardt. He was a ground-breaking master of gypsy jazz guitar music. Sinti gypsy music became a big influence to his newly invented jazz guitar style that was later called “hot” jazz guitar. He had a unique style of percussive swinging approach when playing. And what made him even more extraordinarily special is the fact that his third and fourth finger were partially paralyzed. He played during the World War II wherein he captured the hearts of his audience and diverted their attention from the chaotic situation. Some of his original songs that have been used as jazz standards are: Minor Swing, Belleville, and Nuages. March 6, 1923 – June 15, 1968. His real name was John Leslie Montgomery. He was an African-American jazz guitarist and composer. 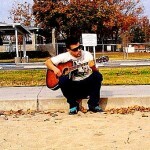 He was a self-taught guitarist who was able to play by ear. He is widely known for his use of octaves during his solos which was later called as the “Naptown” sound. He was an excellent “single-note” player and was very influential in the use of block chords. 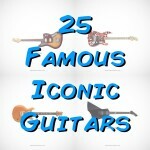 He was also recognized by DigitalDreamDoor as one of the greatest jazz guitarists of all time. In 1966 he won the Grammy for Best Instrumental Jazz Performance, and in 1969 he won it again for the second time. Some of his popular songs are: Four on Six, West Coast Blues, and Impressions. At long last, the list has come to an end. You can agree or disagree, obviously. But for me, these guys are simply epic, and have massive influence on what we call “music” in the modern day. Feel free to comment and let me know who, in your opinion, is missing on this list. One of my mentors and all time favorite is Joe Pass. When I first studied with him he was so giving and patient. I learned so much from him that I was able to pass his wisdom on to my students at MI in Hollywood. You mentioned two sides of the triangle: Clapton and Paige, but you missed the third…Jeff Beck! 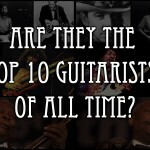 I think your post should be titled, “The 15 Most Influential Guitarists of All Time”. Although Jimi Hendrix was an innovator and we all love him and have been influenced by him, he was, technically speaking, a very sloppy guitar player. B.B. King is a great singer and a solid player, but his playing is anything but “intricate”. It is simple and smooth. B.B. 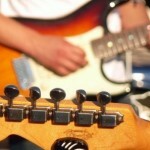 himself admits that he can’t play chords very well. Also, the title of “Master of the Telecaster” went to Albert Collins. Tommy Emmanuel is not a guitar gad. He is THE guitar god.